After the first break in the chronological sequence of events during Daniel’s 70th Week, picturing God’s Remnant praising God with the raptured Old Testament saints and the Bride. Just after John pictures the blood washed Israelites and Gentiles, the Lamb opens the seventh seal. All was quite in heaven for a half an hour, the Elders quit playing their harps, and even the cherubim and seraphim were silent. This silence lasted even while 7 angels were each given a trumpet, and until another angel cast fire from the altar down to earth. Now down on earth; voices, thunder, lightening and an earthquake broke the silence. With the fire, there ascended to the throne incense and the prayers of the Tribulation saints praying for vengeance on their enemies. Let the trumpet judgments begin. Revelation 8:1 ¶ And when he had opened the seventh seal, there was silence in heaven about the space of half an hour. 1. Habakkuk Asked God, How Could Idolatrous Babylonians Judge Judah? Zephaniah 1:7 ¶ Hold thy peace at the presence of the Lord GOD: for the day of the LORD is at hand: for the LORD hath prepared a sacrifice, he hath bid his guests. 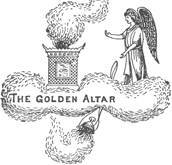 Revelation 8:4 And the smoke of the incense, which came with the prayers of the saints, ascended up before God out of the angel’s hand. See Exodus 9:16; Amos 3:6; Joshua 6:13-16; Zephaniah 1:14-16. Revelation 8:7 ¶ The first angel sounded, and there followed hail and fire mingled with blood, and they were cast upon the earth: and the third part of trees was burnt up, and all green grass was burnt up. Revelation 8:9 And the third part of the creatures which were in the sea, and had life, died; and the third part of the ships were destroyed. 2. In Amos 6:12 - Rendered "Hemlock"
3. The Greek Name Is Absinthion - Means "Undrinkable." Jeremiah 9:15 Therefore thus saith the LORD of hosts, the God of Israel; Behold, I will feed them, even this people, with wormwood, and give them water of gall to drink. Jeremiah 9:16 I will scatter them also among the heathen, whom neither they nor their fathers have known: and I will send a sword after them, till I have consumed them.